Travelling by train in Switzerland with kids is one of the highlights of visiting that chocolate-box pretty country. Here’s my journey on the William Tell Express – go soon or it will be gone. With the touch of a button our seats rotate. We can sit facing forward, sideways or do circle work – not a good idea, I discover, as a wave of nausea overcomes me. We’re hurtling through mountain passes on curving tracks. In fact, seat belts wouldn’t be a bad idea. We’re travelling on the Wilhelm Tell Express, from Lugano in Switzerland’s deep Italian-speaking south, to Lucerne in the country’s centre. 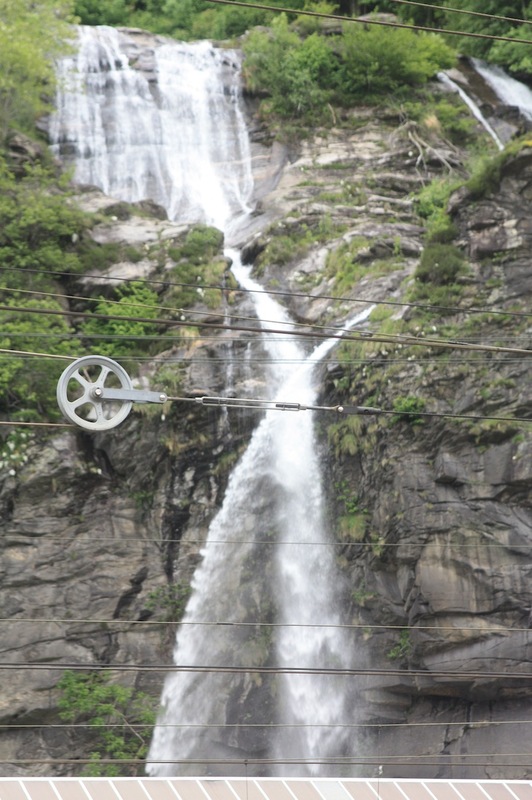 At different times the journey takes us across, through and under the alps via the famous Gotthard Pass. 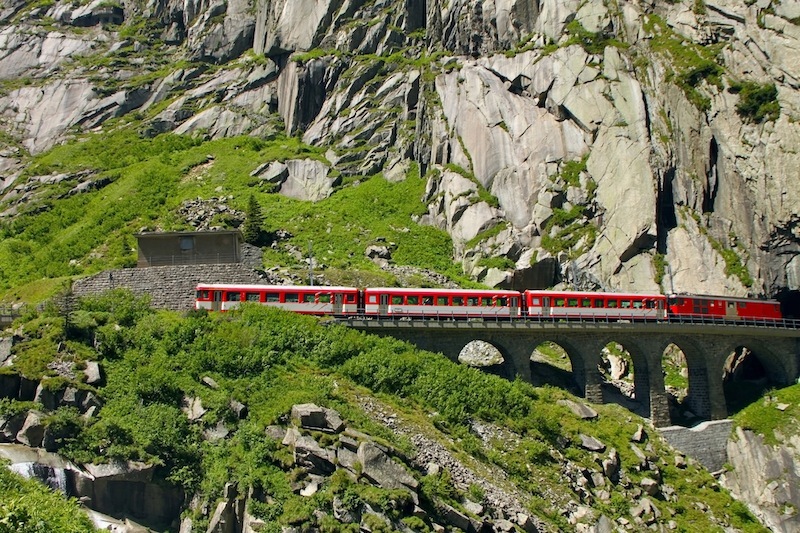 This is one of Switzerland’s most famous scenic rail journeys. We have the panorama car at the front of the train virtually to ourselves. The only other travellers are a German-speaking couple and our multi-lingual hostess, Giuliana, who is a mine of rail-related facts and serves drinks and snacks. We’re not the only passengers on the train of course. Behind us are hundreds of others in the regular first and second class carriages on this busy route connecting Zurich and other Swiss cities to Milan and beyond. But they aren’t in a luxury carriage with huge windows, a glass roof and rotating seats to make the most of the picturesque views. We even have video screens – with commentary provided in multiple languages through the personal headsets that connect to our seats – and Rossini’s energetic William Tell Overture as background muzak. Da duh da duh da duh da da, da duh da duh da duh da da. It’s absurd and fabulous and we can’t help but laugh. The first landmark of interest on this south to north journey is the Santa Petronilla waterfall behind the station of Biasco – two cascades of melting winter snow that cross each other dramatically as they plummet to the river below. If it wasn’t for Giuliana, I might have missed this sight altogether. Fortunately the recording piped through to my personal headset informs me about other landmarks as we pass them, while the monitors in the carriage screen graphics with interesting facts and movies as the journey progresses. Not long out of Biasco we enter a long tunnel, the first of the famous seven spiral tunnels to the Gotthard Tunnel itself, which was built between 1871 and 1881 and opened officially in 1882. These tunnels are no less an engineering feat today than when they were built. You can’t tell as you sit in the darkened carriage, but the train is travelling in a loop and ascending at the same time. You only realise this when you notice the exquisite Swiss alpine landscape you’re looking at is the same as the landscape you saw a few minutes ago, only from a different, higher vantage point. Before the Gotthard tunnels were built it took 50 hours to get from Basel to Milan. One of the movies screened in the premium carriage covers the establishment of the railway system and the building of the 15-kilometre Gotthard Tunnel and the innovative spiral approach tunnels on either side. What’s fascinating about this journey, the tunnels and the project of which it was part is that it is all happening over again. 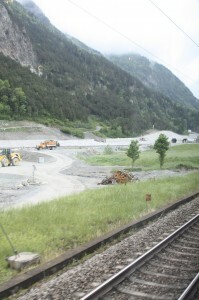 A new Gotthard, the Gotthard Base Tunnel, is currently being built, scheduled to open in 2016. Once work on the 56-kilometre tunnel – the world’s longest – is complete, the rail journey from Zurich to Milan will take just two hours and 50 minutes, 50 minutes less than it currently takes. The new tunnel, which has been 20 years in the making and is arguably the most massive infrastructure project Europe has ever seen, burrows 2438 metres below the surface of the earth. For kids who like to learn about diggers and engineering it’s completely and utterly fascinating. The sad thing is that once the new tunnel is open, it’s likely that the rail journey we’re taking will cease to exist. Giuliana is a little flustered today as the train is running a few minutes late, due to a locomotive at an earlier station that had to be moved to allow the train to proceed. “The first thing we need to ensure is safety but the timetable is the timetable,” she says. Ah, yes. Swiss timing. She distributes postcards with instructions to write them on the train and she’ll have them posted afterwards. Postcards! The kids don’t even know what these things are. Postcards, train travel: if it wasn’t for the rotating seats and screens I’d think we’d stepped back in time. We stop at Airolo station, which, the commentary tells us, at 1141 metres above sea level is the highest in the Swiss railway network. There’s a monument on the platform by the artist Vincenzo Vela to the many workers who died building the Gotthard Tunnel. The highest point on the line is 10 metres higher and inside a tunnel. We started the journey in Lugano, the lowest point on the route, so I’ve climbed as far as you can in just over an hour. Exiting a tunnel and pulling into Goshenen station we see a landscape that’s all white. Unseasonably cold spring weather and a burst of late season snow transform the landscape, the spruces climbing up mountainsides looking like they’ve been dusted with icing sugar. Descending the northern ramp of the Gotthard, we pass by the village and baroque church of Wassen three times – above it, at the same level and below it. Effectively it’s the railway version of a hairpin bend that just keeps on giving. As the train pulls out of Erstfeld we can see the entrance to the new Gotthard Base rail and road tunnel that’s under construction. For us, the rail journey ends at Fluelen but the Wilhelm Tell Express experience is far from over. 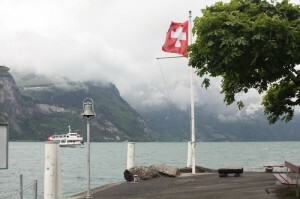 At Fluelen’s wharf we board an elegant historic steamer that transports us across Lake Lucerne. We pass the landmark that gives the whole route its name – Tellskapelle (or Tell’s chapel) at the foot of the Axenburg cliffs in Sisikon. According to legend it was here that Wilhelm Tell leapt from the boat of his captors and escaped, allowing him to assassinate the tyrant Gessler and initiate the rebellion that led to the foundation of the Old Swiss Confederacy. Among other places, he is immortalised on the back of the five franc coin. Our premium tickets include a care package of brochures, chocolates and a cute mini Swiss Army Knife, a drink on the train and one on the boat, and a “gourmet” lunch. 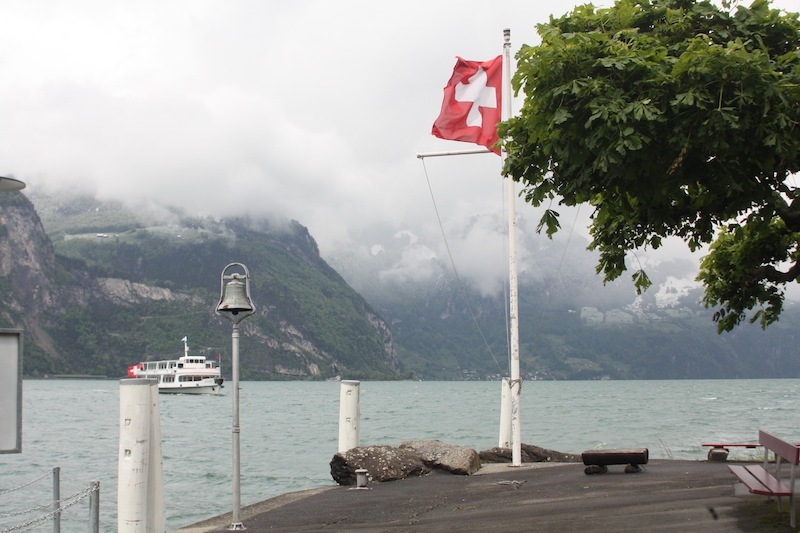 While I wouldn’t return for the food – packet mashed potato just doesn’t cut it – I’ve become quite partial to Swiss wine, which is rarely exported, and enjoy several glasses as we chug slowly, hypnotically up the lake. 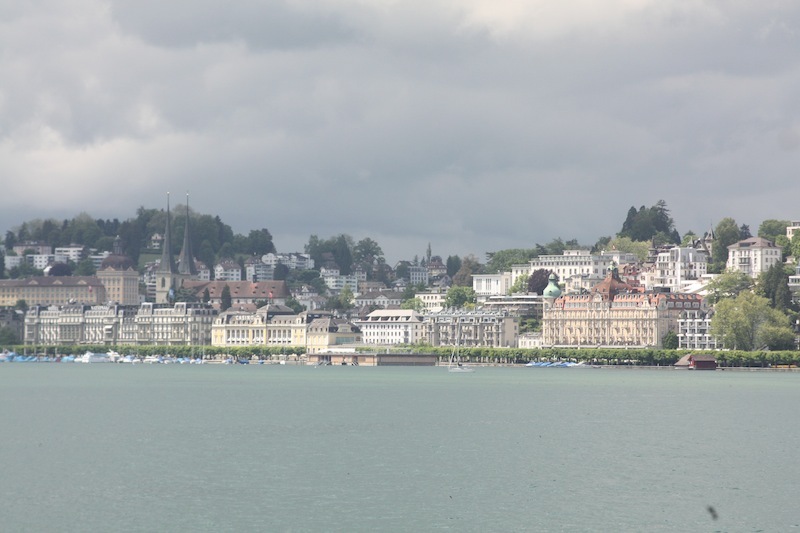 Just under three hours later, as we berth in the devastatingly pretty lakeside city of Lucerne, mellow from wine and enough chocolate box views to last a lifetime, we decide scenic travel in Switzerland is the perfect family trip, rotating seat or not. 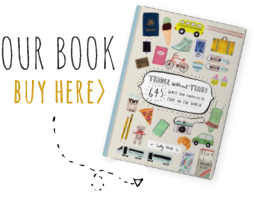 A version of this article was first published in Fairfax Media’s Traveller, July 20 2014. It’s possible to travel on the Wilhelm Tell Express journey in either direction, from Lucerne to Lugano (or Locarno) via Fluelen or vice versa. 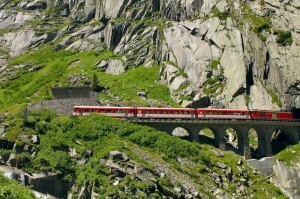 For further details or bookings, see myswitzerland.com/rail or raileurope.com.au. Prices start at $247 a person. 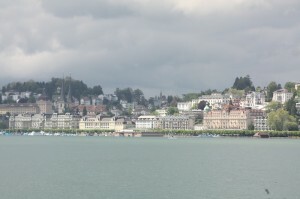 The writer travelled courtesy of Swiss Tourism.